Edgefield Police Department received two reports of shots being fired last week both from the Mims/Coral Street area. According to Police Chief Ronnie Carter, who spoke to the Advertiser regarding the incidents, the first report was received Sunday night, March 10, between 9:00 and 10:00. An anonymous caller reported to dispatch that he had heard shots fired in the area of Mims Street and that he saw a vehicle speed down the road. Officers with EPD did respond to the scene, but no one in the area would provide information as to what may have happened. However, officers did recover shell casings from the area. Then, three nights later on the Wednesday, March 13, another anonymous caller called dispatch to say that approximately 40 shots were fired in the area of Mims and Coral Street. Again, officers responded to the scene and collected shell casings, but again, no witnesses would come forward. Anyone with information regarding these events is asked to call the EPD at 637-4014 or dispatch at 637-5337. The Johnston Police Department received two more reports of discharging of firearms last week. These reports come on the heels of the shooting incident Saturday night, March 9, in which an estimated 30 shots were fired after an alternation at the Sertoma Club in Johnston. The first of the most recent reports was received by the Advertiser on Thursday, March 14. The Advertiser was contacted by a property owner of a home on Andrews Street to report that a tenant had returned home to find where a bullet had been shot into his home. The bullet traveled through a back door and struck a picture frame inside the residence just feet from where the tenant usually sits. (See our related story for more information on this scene) That property owner questioned whether the bullet found in his rental property could be related to a reported shooting the previous evening on Aiken Avenue. Investigating this report, the Advertiser learned that JPD had received reports the previous night of shots being fired in the Johnson Street/Aiken Avenue areas. According to the dispatch log, two calls were received a little before 5:30 p.m. on Wednesday, March 13. The first caller stated that someone in a car was shooting in the aforementioned area. In the second call, the caller reported that juveniles were shooting in the area. The log confirmed that contact was made by law enforcement with some juveniles found in the area, but no firearms were found. The Advertiser did speak with Johnston Police Chief Lamaz Robinson regarding both of the reports of shots fired in the Aiken Avenue/Johnson Street area and the home that was found to have been shot. Robinson said that no shell casings were found in the area where the shots were reported. Additionally, Robinson said that could not confirm that the reported shots fired on Aiken Avenue/Johnson Street and shooting at the home on Andrews Street and the bullet that was found there are related. Then, on Thursday evening, March 14, another report was received of shots being fired in the Walker/Johnson Street area in Johnston. That call was received between 6:30 and 7:00 p.m. according to Chief Robinson. In that incident, Robinson said that it was reported that “guys” were riding down the road shooting at another male. Shell casings were found in the area, and Robinson said that the JPD did have suspects but had no one yet in custody in relation to this shooting incident. No injuries were reported in this latest event, and when asked if this shooting incident is related to the others that have been reported of late in the Johnston area, Chief Robinson said, “I have no clue right now.” Based on information JPD had obtained, however, Robinson said that this latest event was sparked by comments made on social media. When asked if those believed to be involved are juveniles, Robinson said no, that those believed involved are “adults by statute”. The Edgefield Advertiser was contacted by a property owner Thursday, March 14 after a home he owns on Andrews Street in Johnston was found to have been shot. According to the property owner, and documented in photographs the Advertiser later took of the scene, the bullet was shot into the back of the home. It struck about 2 feet from the bottom of the back door where it entered the home. It appears the bullet ricocheted about the room, striking a picture frame, and landing under a sofa. The property owner noted to the Advertiser was on the scene as officers with the Johnston Police Department were there conducting their investigation into this matter. According to the property owner, he saw no photographs being taken of the scene by those responding officers. Additionally, he informed that after looking for the bullet and not finding it, the tenant of the property was told to call law enforcement if he later found the bullet. However, the property owner stated that as he, the property owner, observed the naturally assumed path of the bullet based on the evidence he saw, he suggested to the officers that the sofa area be searched. Upon doing so, the bullet was found under the sofa. 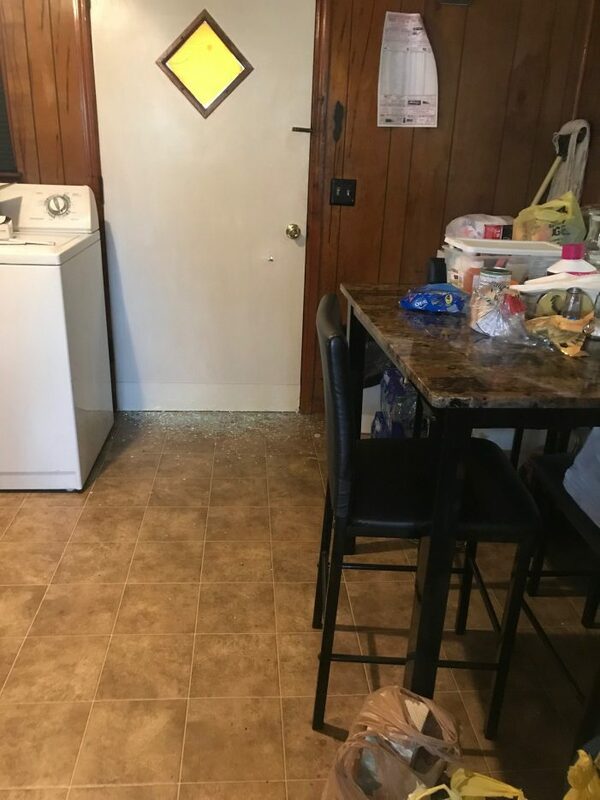 The property owner stated that he was concerned about property being destroyed as a result of the shooting events in Johnston and lives being put in danger as it was determined the bullet that entered this home hit about 2 feet away from where the tenant usually sits. (The tenant was not at home when the shot was fired into his home.) The property owner further stated that in regards to the shooting events, he is concerned that attempts are being made “to brush it off” as shooting into the air when the damage to his property clearly shows that objects, perhaps even people, are being fired at. The Advertiser did contact Johnston Police Chief Lamaz Robinson regarding these concerns. As for the photographic evidence of the scene, Chief Robinson did not confirm that photographs were taken of the scene but rather stated that responding JPD officers were wearing their body cameras while they were there and did record the scene. Robinson also stated that he could not confirm if the shooting into the home was connected to an incident reported that same day on Johnson Street/Aiken Avenue (which Robinson stated is about 2 blocks away from Andrews Street). However, the property owner told the Advertiser that he confirmed and provided evidence to law enforcement that the damage to his property could have occurred within the same time frame. Both the property owner and Chief Robinson expressed frustration in the lack of people coming forward with information regarding these shooting incidents. “We’ve talked to several people,” Robinson said. “Nobody’s saying anything.” When asked if thought these shooting incidents could be gang related Robinson stated, “It’s hard for me to say.” He went on to add, “I’ve never known us to have a gang problem in Johnston.” However, when asked again that same question the following day after the most recently reported shooting incident in Johnston and after Robinson stated that he had spoken with Edgefield Police Chief Ronnie Carter, Chief Robinson said that he “can’t tell you there’s no correlation” between these shootings and gang activity. He said that there seems to be a “yo-yo” effect between the shootings in Edgefield and Johnston. As reported in last week’s edition of the Advertiser, a Johnston citizen brought before the Johnston Town Council concerns “over law enforcements failure to present itself after his wife’s call for assistance during a shooting incident.” This shooting incident to which the citizen was referring was the reported estimated 30 shots that were fired at the Sertoma Club in Johnston after an altercation at a function there Saturday night, March 9. The Advertiser further reported that Johnston Police Chief Lamaz Robinson relayed to Council and the concerned citizen that “the dispatcher had failed to deliver the request for help to the Johnston Police Department.” The correctness of the reporting of this statement was confirmed by both the Mayor of Johnston and a Johnston Council member, both of whom the Advertiser spoke with and they confirmed this was the statement made in regard to this incident. However, the Advertiser has since discovered that indeed the call regarding that citizen’s call was given out to the Johnston Police Department. According to the dispatches’ log, this call was one of the first received and given out that night in relation to the shooting incident. The call was actually given out not as an alarm call but as subjects running through the complainant’s yard. The call was given out to JPD officers, and an officer did respond to dispatch as having received that call. However, as evident by the complaint to Council, no officer ever responded to that scene. Additionally, which officer responded as having received the call was not able to be determined.